Lord of Ultima, a new browser-based online strategy game from Electronic Arts, is now open to the public and it actually looks pretty sweet. Nominally set in the Ultima universe, Lord of Ultima is a free strategy game in which players build and manage cities, engage in diplomatic and military campaigns and strive to establish themselves as powerful, peaceful merchants or feared warlords. 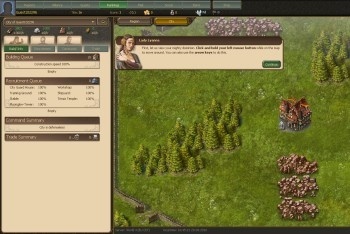 Tightly-integrated online play is a central feature of the game, as players launch trade missions, forge alliances, take part in online chats and discussions in community forums, and of course go to war with their fellow gamers. "Lord of Ultima was designed to ensure that everyone, from strategy newcomers to diehard fans, can make it to the top of the leader board," said Volker Wertich, Creative Director of Phenomic, the EA studio behind the game. I'm not entirely sure what the Ultima connection is but the fact that Wertich referred to it as "the legendary world of Ultima" and not Britannia, its proper name (if you'll excuse my pedantry) makes me think that it doesn't extend very far beyond a marketable title. But I spent a few minutes playing around with it and while the early stages are very conventional - build a sawmill, upgrade your town hall, build a quarry, etc. - it appears to have surprising depth, particularly for an online game, and looks pretty good too. I'm no strategy expert by any stretch of the imagination but it looks to me like the sort of game that fans of the genre could really get into. More important, it's an interesting crossover title, a sort of Farmville for so-called "real gamers," and it also adds some heft to EA's oft-stated commitment to building the online space. This is the future, kids! Go give it a try at lordofultima.com.